One of our young Rhode Island Red hens has decided she wants to be a mother. It took several days for me to realize that this one particular chicken (I think Tom named her Big Bertha) was sitting on one of the nests every time I went into the coop. In the evenings, Tom was having to get her out of the nest and put her on the roost bar. Finally, last week I lifted her out of the nest box and put her outside with the rest of the chickens. She walked around, upset and cackling, for a few minutes, ate a little bit of food, drank some water and got right back in the nest box. At this point, something clicked in my brain and I realized my gal was "broody" and wanted to hatch a clutch of eggs. Even though we collect the eggs every day and most of the time she was sitting on an empty nest, she was determined to sit there, hoping some chicks would appear. She had no way of knowing that her attempt to become a mother was all for naught as we don't have a rooster to help in this regard. Here she is sitting on the nest. I've done some reading and talked to a couple of other folks about broody chickens. Apparently, one way to break this cycle is to separate her from the other hens and keep her in a pen or cage away from the nest boxes until she "forgets" about hatching eggs. So, here's what we've done. The pen is a simple, portable affair that Tom built several years ago for something or other. It may have even housed a compost pile at one point. At any rate, it is just 4 panels, each made of board frames covered with chicken wire. Each of the 4 panels is connected to one of the others with hinges at the top and bottom, like this. This creates 2 sections that can be folded up for easy storage and transport. The open side of each section has a hook and eye, so it can be secured to the other section. I have been putting Big Bertha in this pen during the day. I'm not sure this is going to work because she still joins the other chickens at night in the coop and that is where the nest boxes are. So, she usually gets in a nest box before Tom gets over there each morning to open the coop and let them out for the day, thus reinforcing her desire to hatch eggs. He gets up early, but not always as early as the chickens! We'll see if this works. I have covered the pen with shade cloth to keep her cool and have put a water bowl and food bowl in the pen. The first day I put her in the pen, the other hens were very curious about this new turn of events. She was not at all happy about being in the pen, much less having the other girls peering in at her. She puffed up her feathers and spread her wings out in a menacing manner. Although she was not wet, this gives new meaning to the phrase "mad as a wet hen"! A few weeks ago, I moved the wildlife camera to the raised bed garden to see what's happening out there. I found that deer come through the garden. In fact, here is what appears to be a whole parade of them. The neighbor's Great Pyrenees dog comes over to visit. This is a good picture of him in the fog one morning. We don't mind. It would be nice, though, if he would keep those deer out of the garden this year. One night when we had snow in the ground, you could see tracks that seemed to appear out of nowhere, having been made by invisible bunnies! And, there is the occasional coyote who comes through. Those rabbits better watch out with him on the prowl! During the day, there are other happenings. We've started letting the chickens out to free-range a bit. This one seems to be doing some sort of dance. And, finally, there was this old couple who rode through on a Gator one day. I have no idea who they could be! My husband is not an adventurous eater. When he finds something he likes, he sticks with it and rarely deviates. Take bagels for instance. He likes sesame seed bagels with strawberry cream cheese. I buy the bagels at Panera Bread and, until recently, I bought the cream cheese at the grocery store. Now, I've been a label reader for years. I normally check the ingredients on everything before I buy it. I never worried about the strawberry cream cheese because all it should contain is cream cheese and strawberries, right? Nope. Silly me to trust a multinational food mega-conglomerate to have my best interests in mind. I found that the most popular brand of this cream cheese contains not only the food dye Red 40, but the artificial preservative sorbic acid, as well! Time to make my own. After all, I've been making yogurt for years. I wrote about that in this post: Making Yogurt. How hard could it be to make strawberry cream cheese? As it turns out, not difficult at all. Here's how. Buy a block of plain cream cheese and let it sit at room temperature until it is softened. Hunk it up and put it in a food processor. Add a few frozen strawberries that have been thawed. Then add 2 - 3 tablespoons powdered sugar. This is so much better tasting than the store-bought kind and one bag of frozen strawberries makes several batches. Come to think about it, I have never checked the ingredients on frozen strawberries. Surely they only contain strawberries? Sigh. I better go check. We've all heard the sad story of how honeybees are declining at an alarming rate. Honeybees play a critical role in pollination of various plants and crops and their decline across the globe means a growing risk of food shortages. It is still a mystery as to why these bees are disappearing, but the good news is that other types of insects can serve as pollinators, too. One of these is the solitary bee, or Mason Bee. In the world of bees, there are many species. Each type is classified as either social or solitary. Social bees, like honeybees, live together with thousands of others and have specific job duties. 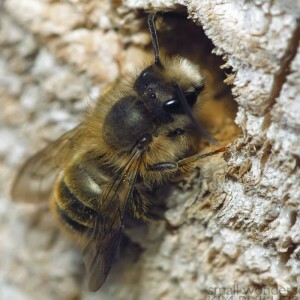 Solitary bees, like Mason bees, spend their entire life living alone. Every female bee is both a queen and a worker bee. To help increase the number of bees on our farm, Tom built a couple of boxes especially made to attract these solitary bees and increase their population. The boxes are simple to make and look like this. They are filled with rolled up paper tubes in which the bees lay their eggs. To make the tubes, cut sheets of paper into fourths. Next, take a pencil and roll the paper lengthwise around it. Tape each end of the paper roll to keep it closed. Next, fold one end of the paper tube and staple it closed. Finally, put the paper tubes in the bee box with the open end facing outward. The box should be hung so that it faces east or southeast so that the morning sun will help warm the bees.